Mexico's Economy Minister Ildefonso Guajardo addresses the media to close the second round of NAFTA talks involving the United States, Mexico and Canada at Secretary of Economy headquarters in Mexico City, Mexico, September 5, 2017. 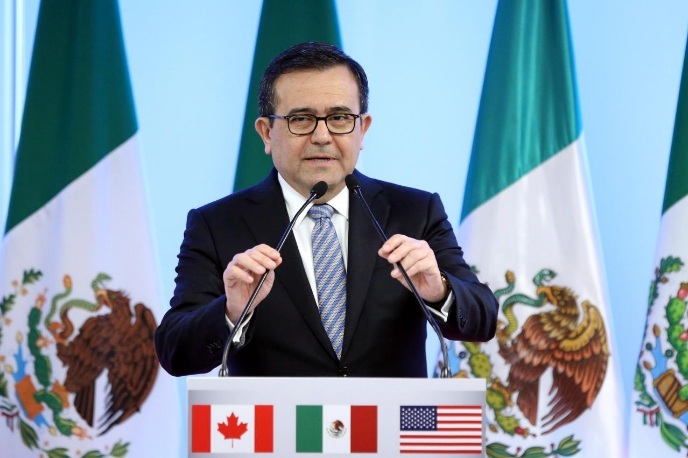 MEXICO CITY - As the United States, Mexico and Canada prepare for another round of negotiations to revamp the North American Free Trade Agreement, Mexico’s economy minister on Tuesday urged the parties to stop fixating on trade deficits between the countries. The trade disparity between the U.S. and Mexico has been a frequent complaint of President Donald Trump, who has threatened to withdraw from NAFTA if he does not get concessions to reduce a U.S. trade deficit of around $64 billion with Mexico. But Mexican Economy Minister Ildefonso Guajardo insisted that talks to overhaul the 23-year-old trade accord should not center on trade deficits. NAFTA is a key pillar of the Mexican economy, with some 80 percent of the country’s exports sent to the United States. But Guajardo suggested that the demise of the trade agreement could create complications for the U.S. as well. The U.S., Mexico and Canada will hold a fourth round of negotiations from Oct. 11 to Oct. 15 in Washington, D.C.
As the United States, Mexico and Canada prepare for another round of negotiations to revamp the North American Free Trade Agreement, Mexico’s economy minister on Tuesday urged the parties to stop fixating on trade deficits between the countries.